Big Band Library: March 2016 "Big Band News"
MARCH 2016 "BIG BAND NEWS"
So if you like Harry James’ music as much as I do, I urge you to check out The Harry James Appreciation Group on Facebook (you must request membership, as it’s a closed group). Trumpeter Chuck Par-Due and his wife, vocalist Cheryl Morris, keep the discussion lively and interesting, and often share various photos and audio or video recordings of Harry James-related topics. 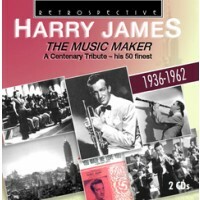 Just in time for the 100th anniversary of Harry’s birth, the Retrospective label in England has issued a new 2-CD set, “Harry James: The Music Maker: A Centenary Tribute – his 50 finest 1936-1962” (RTS 4281). If you don’t already have the recordings, it’s a nice variety of some of Harry’s best. Have you seen my “Collector’s Checklists” of Harry James? So far, I have prepared one for LPs (not all of the anthologies which include Harry are yet added) and one for CDs. Meanwhile, trumpeter Doc Severinsen came through Illinois recently and stopped at several institutions, including VanderCook College of Music in Chicago, Northwestern University in Evanston, and Elmhurst College in Elmhurst. This month’s issue of Downbeat includes some comments that Severinsen made about Harry. Mar 31, portion of European tour. British Columbia, Canada; Mar 24, Port Angeles High School, Port Angeles, WA. Kilmanock, VA; Mar 20, Sellersville Theatre, Sellersville, PA.
Jan Slottenas, director of The Glenn Miller Orchestra in Sweden, reports that during 2016 they will continue to resurrect pieces from the original Miller Orchestra book that haven’t been played after Glenn’s disappearance. Songs which Slottenas mentioned are Baby Mine, Daisy Mae, I Just Got a Letter, At the President’s Birthday Ball, Measure for Measure, Isn’t That Just Like Love, The Little Man Who Wasn’t There, There’ll Be Some Changes Made, One Dozen Roses, Down for the Count, and Our Love Affair. D&P Music, LLC and Nick Hilscher Productions, Inc. I always welcome a new recording by today’s U.S. Glenn Miller Orchestra and they seem to be averaging one a year lately, more than any other name band today. After listening to this one several times, I had a certain suspicion so I re-read my reviews of the previous two CDs under Nick Hilscher’s direction (“In The Mood” and “Timeless”) and found that my overall feelings about all three of their CDs remains the same - and that is... there are fleeting moments when I think the band is playing quite well yet frequent moments to my ears when they aren’t. On this new CD, they seem to be blending the sound of the original civilian Miller band (Elmer’s Tune, American Patrol), with the robust sonics of its 20th Century Fox movie soundtracks (Moonlight Serenade, Kalamazoo), and on still others the subtle differences how Miller’s Army Air Force ensemble played things (In the Mood, Tuxedo Junction). I would give Nick Hilscher credit for that, as he really (and rightfully) seems to have fully studied the authentic Glenn Miller music. In my opinion, the star of this whole disc and a real asset to The Glenn Miller Orchestra is tenor saxophonist Cody Leavel, as he often evokes the sound of Tex Beneke, one of the original Miller stars. If part of the band’s purpose is to sound like the one that started it all, Cody represents Beneke’s tenor sax role very well. As with the two previous Hilscher releases, the new CD’s tri-fold packaging is in a fresh color and the cover design, incorporating Glenn Miller’s name, written in a font similar to the GMO bandstands used by Buddy Morrow (and reminiscent of the famous RCA Victor “Limited Edition” album), is a nice touch, though I think using a photograph would have been more attractive. Also as before there are no liner notes, other than tune titles, recording data, and credits for composers, arrangers, soloists, and publishers. Curiously, the trombone soloist on King Porter Stomp is not indicated (I hope it’s not George Reinert, as he’s been there a long time). Whoever it is, to me the trombone solo comes off almost like a parody. But this isn’t camp, it’s music and I get no such feeling of parody when listening to Glenn Miller’s own performances of the tune (and people have always made the point that Miller was a good, but not great, trombonist). It may seem picky for the uninitiated, but I must say that the difference between Nick Hilscher singing Fools Rush In on this new CD and Johnny Desmond crooning it on that 1984 TV production videotaped at Glen Island Casino, “Glenn Miller: A Moonlight Serenade,” is illustrative of why I think today’s Glenn Miller Orchestra is good (very good, at times) but not great. Again, I know Nick to be a fine singer – but certain songs match him better than others. This one seems forced, while Desmond’s, in comparison, sounds so natural. I should mention that one of the latest videos posted to YouTube shows Hilscher doing a credible vocal on a forgotten ballad from 1941, You and I; I do appreciate that he has brought back so many forgotten songs and instrumentals. And this and the many other concert excerpts posted to YouTube show how well Hilscher and the band are received in-person. But the band still has a problem with the primary Miller reed sound - in my opinion, Kevin Sheehan's "nannygoat" clarinet vibrato ruins things. Lastly, I’m unsure why Moonlight Serenade, In the Mood, Chattanooga Choo Choo, Tuxedo Junction, American Patrol, Kalamazoo, Little Brown Jug, and A String of Pearls needed to be chosen yet again for a CD. Yes, I noticed the subtitle “Featuring The Greatest Hits,” but why, since renditions by several previous GMO editions under other leaders as well as Hilscher himself are still offered on the Miller Orchestra’s own website. As I said before, if a younger fan of the band wants to take home a souvenir following one of the band’s concerts or if someone wants to give a nice present to a relative who enjoys the music, I suppose this would be fine. But for a longtime Miller aficionado, it doesn’t compare to the real thing. How about if the next Glenn Miller Orchestra CD could be taped live at The Glenn Miller Birthplace Festival in Clarinda, Iowa? It would seem a natural location (a tie-in that would benefit both the band and the city) and, besides, Nick especially plays a lot of lesser-heard Miller music on those dates. Ok, another reality check! The 20 songs and instrumentals on this CD, selected from the total of 30 recordings made in 1971-72 for Columbia House in which a number of alumni, including Ray McKinley and Bobby Hackett, returned, have been compiled over and over on way too many Victor (Japan) CDs, plus the two 1998 volumes on Hindsight (HCD-267 and HCD-269) titled “The Best Of The Glenn Miller Orchestra In Stereo” which are still available on the Orchestra’s website. What, then, is the point of this new release? DeFranco’s band was, at the time of these versions, vastly inferior to Syd Lawrence’s Miller-styled band in England (too bad Columbia House didn’t use the Lawrence group to back the alumni on the recordings). The vibrato of the lead clarinet in DeFranco’s band is so bad it sounds sour and much of the section work is sloppy. Actually, and nobody talks about it, there were two different bands used for the Columbia House project heard on this new CD – DeFranco’s in New York City and a group of studio musicians out in Los Angeles. I can certainly tell the difference (the L.A. band plays Moonlight Serenade, Sun Valley Jump, and Anvil Chorus, and each beats DeFranco’s selections hands down). Johnny Desmond and the vocal group with Chuck Goldstein and Ralph Brewster of the Modernaires and Gene Steck of The Crew Chiefs are wonderful to hear again. But even guests like McKinley, Hackett, or Al Klink, Bernie Privin, Trigger Alpert, etc., could not lift DeFranco’s band up to par (I don’t think McKinley’s voice or drums were even miked correctly, as he sounds weak on these). Likewise, Ray Eberle told me he was sorry he returned for these recordings and, to quote a Miller song title, I know why! Far from being the “best” or the “ultimate,” these are more likely the worst recordings ever authorized by Glenn Miller Productions for release (though the “clams” on the RCA Victor “Returns To Glen Island Casino” album might give it some competition). one DVD. Sessions from 1928 to 1974, though much previously available. Stan Kenton. “Concerts In Miniature: Volume 12,” Sounds of YesterYear (E) 2020. Robin, Bags, and Artistry in Rhythm. Glenn Miller Orchestra: Part Two 1946/47,” Sounds of YesterYear (E) 2021. The Blues of the Record Man, Moonlight Serenade, and Sunrise Serenade. Calloway, Redman [ Redmond-sic ]. I continue to work very hard on creating Collector’s Checklists of 33 rpm albums by the big bands. My latest include Jimmie Lunceford, Paul Whiteman, Paul Weston, and Wayne King. Use the lists to see what was issued or to compare it to what you have in your collection. LP "Pat Longo's Super Big Band: Billy May For President: Featuring Frank Sinatra Jr."
'83 with arrangements by Billy May. '29-'31; Dorsey Brothers '34; Noble '35-'36. Leader of own band. Millinder '44-'45; Kirk '45-'46; Basie '52-'53 / '57. 1973), released in 1999, and "Artie Shaw: Self Portrait," released in 2001. Cy Touff, b.Mar 4, 1927. Trumpeter with Herman '53?-'56?. Red Callendar, b.Mar 6, 1918. Bassist with Armstrong '37. McKinley '42; Beneke '70s? / '80s?. Heinie Beau, b.Mar 8, 1911. Clarinetist with Nichols '40; T Dorsey '41-'43. band; Leader of T Dorsey Orch '61-'65. Bix Beiderbecke, b.Mar 10, 1903. Cornetist with Whiteman '27-'29. Bob Haggart, b.Mar 13, 1914, Bassist with Crosby '35-'42 / '58 / '85 / et al. Ina Ray Hutton ,b. Mar 13, 1916. Leader of own band. Les Brown, b.Mar 14, 1912. Leader of own band. '55. Leader of own band. '41; McKinley '46-'50 / '54; Miller Orch-McKinley '57-'62. '40-'41; Calloway '41; Shaw '45. '50 / '51; Dorsey Brothers '54. Hank D’Amico, b.Mar 21, 1915. Clarinetist with Norvo '36-'39? ; Crosby '40-'41. Sonny Burke, b.Mar 22, 1914. Arranger for Spivak '41-'42; J Dorsey '42-'46?. Conductor for Armstrong '55. Leader of own band. Charlie Christian, b.Mar 22, 1919. Guitarist with Goodman '39-'40. Jimmy Blanton, b.Mar 26, 1921. Bassist with Ellington '39-'41. Sarah Vaughan, b.Mar 27, 1924. Vocalist with Hines '43-'44; Eckstine '44-'45. Chummy MacGregor, b.Mar 28, 1903. Pianist with Miller '37-'42. Paul Whiteman, b.Mar. 28, 1890. Leader of own band. until her death in '90. Ted Heath, b.Mar 30, 1900. Leader of own band. Herman '45-'46. Leader of own band. Freddie Green, b.Mar 31, 1911. Guitarist with Basie '37-'84. Next month, two legendary bandleaders are honored, and a third gets some renewed attention. Harry James is one of my very favorite big bands – there are countless examples of Harry and the band sounding wonderful, from the late 1930s into the early 1980s. And it’s on the 16th of this month that – 100 years ago – Harry was born.